Americans want strong, bold solutions to gun violence. We’ve know that from the start, but yesterday with the release of our new poll, it’s become even clearer that voters want meaningful action. And they want candidates who feel the same. Our poll found that candidates with strong, bold messages on gun violence prevention and gun reduction in their campaigns — regardless of party affiliation — enjoyed much stronger support than those who didn’t talk about gun violence at all. It even showed that voters prefer candidates with a strong message to those a weaker message on guns. And, driven by recent mass shootings and the unending toll of the overabundance in guns in America, voters have tired of the NRA and the gun lobby’s brand; more than half of respondents now view the group unfavorably, a major change from the 53 percent of Americans viewed the NRA favorably in a 2017 Guns Down poll. Beyond that, voters want change and support a wide variety of gun violence prevention policies. 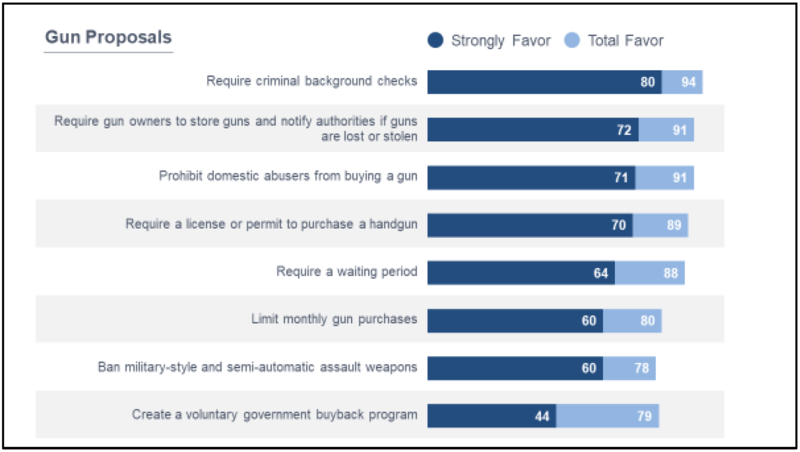 A large majority of Americans support policies like background checks and prohibiting domestic abusers from owning a gun. But upwards of 70% of Americans also support more aggressive measures, including assault weapon bans (78%), voluntary government buybacks (79%), and even required handgun licensing (89%). We know where Americans stand, and we know what the people of this country want. It’s clear and obvious. Our poll is evidence that, once again, voters are saying they support a variety of stronger gun laws and want candidates who share their values. There’s one more thing too. At Guns Down, much of our work focuses on pushing corporate actors to end their relationships with the gun lobby. We’ve seen success with our corporate accountability campaigns, driving insurance companies to cut ties and helping to push technology and car rental companies to do the same. We wanted to know what Americans thought about corporate relationships with gun lobbyists, and companies giving handouts to the NRA in the form of discounts. Americans don’t like it, and they don’t think it’s appropriate at all. To learn even more about the poll and what we found, read the polling memo, available here.